A couple of weeks ago I found a cool new umbrella stand and knew I would like to start filling it with a collection of old canes. While at The Scott Antique Market I came across a basket full of some very unusual canes. Well, unusual to me. These were actually hiking sticks and they had medals attached to them from the places that the hikers had used them. I talked to the vendor about them and she had found most of them on one of her trips to Germany. I loved this umbrella stand with its unusual shape. It looks like an old metal gate pattern. This is the new cane I found at Scott's. It only has four medals on it, but I found the shape and patina of this old stick quite lovely. The top one is this beautiful mountain goat with the name Saalbach. I looked it up and Sallbach is in Austria and it is a beautiful ski community. I found a picture of what it looks like in the summer time when I guess it would normally be hiked. This medal has really aged. It has a picture of a lift on it and the name is Murren Schilthorn which is in Switzerland. Here is a photo I found of it in the summer. This one is Konigstein, Saxony a region in Germany. Here is some info from Wikipedia. 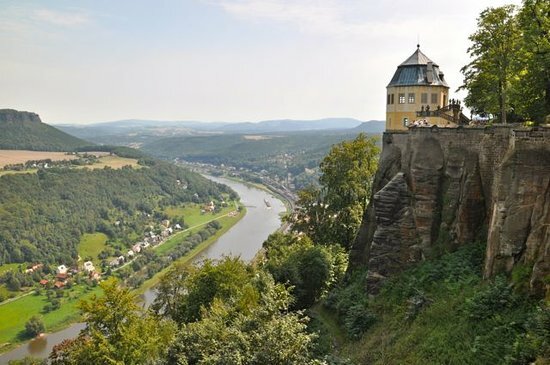 Königstein is a town in the Free State of Saxony in Germany. Königstein lies in the Sächsische Schweiz-Osterzgebirge District and has a population of 2,898 as of 2005. Near Königstein is theFestung Königstein fortress. And the last one shows another ski lift in Bad Harzburg Bergbahn. Here is an image I found. It was fun looking up each one of these places and learning a bit more about where this person has hiked. The cane has splits running down it and knots where there were once branches before it was formed into this walking stick. The only other cane I have belonged to Mr. Savvy's father. He is so glad to have this. The colorful umbrella was a gift to me from my mom many years ago. When it is opened it is a beautiful dragonfly. I didn't buy this umbrella stand the first time I saw it, but decided to get it the second time. It was only twenty dollars. Now, I just look forward to finding some more canes and umbrellas to fill it. The vendor at Scott's says she is there every month so I hope to go back and get a couple more of these. She had one stick that was completely covered in medals. I also found a couple of other things at Scott's and will share them another time. Anyone else collect canes or walking sticks? My daughter went back today to pick up the cabinet and she loves it. I love that stick with the medals on it. What a cool souvenir for a trip! Love your stand. That reminds of me Charleston gates! I had never heard of the little metals to collect on the walking sticks. Makes them very interesting. I love that walking stick. Those photos bring back memories. We used to live in Switzerland when we were first married. I am in the process of getting rid of what few collections I have. Yes, I started with my Dad's old cane and have been on a mission to find some more. I am looking for unique ones. You found a great one! Love the start of your new collection! My MIL has a collection of walking sticks she keeps near their back door in her antique stand. I LOVE IT! Love you old canes. I have a small collection at the front door too. Enjoy! I love that walking stick! And the medals on them from different hikes is the neatest thing. I have a few cool ones...well they are hubbys...but they are cool. YOur pics reminded me of the movie Heidi! Those are fabulous Kim! What a wonderful collection to start. I love them! Vintage medals on wood - what a wonderful walking stick! I don't have anything like that but now you've got me wanting to keep my eyes open! Can't wait to see more when you add to your collection! I can see a great collection starting. I have a few canes...but I would like a few more...I mix them with my umbrellas...the old ones. I love to look at the walking canes I come across at the antique marts, Kim. You're off to a nice start with your collection. Always fun to start a new collection Kim! Your canes are so neat. What a great new collection! I love that you looked up the places from the little plaques. Thanks for sharing this! Great walking stick you bought. We bought one when we were visiting the Appalachian mountains in North Carolina. It has a carved head at the top and we love it. Ah the Volksmarch momento's. When my hubby and I lived in Germany we would sign up for a Volksmarch every month or so. Usually a lovely 5k stroll thru beautiful countryside. We wore our completion medals on our hats. Other people wore vests or placed them like yours, on a walking stick. 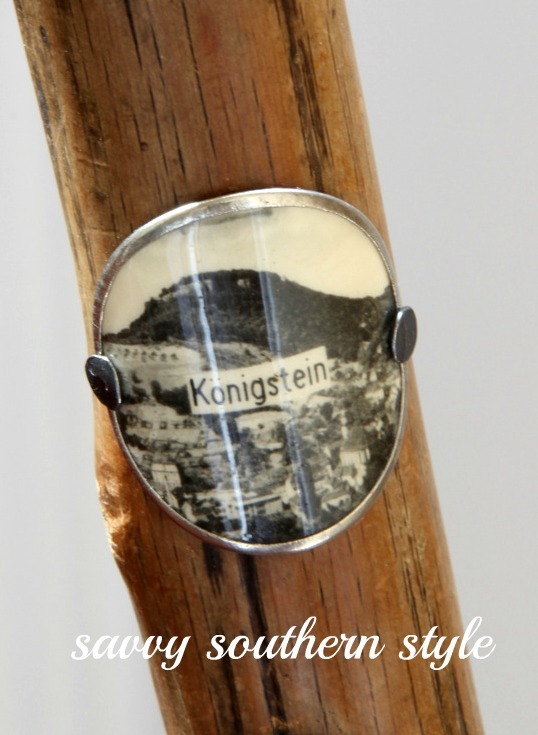 The pictures of the places marked by the medals instantly made me think of Heidi and The Sound of Music. Nice, unique piece. I have a collection of canes, I need to share them in a post. I love yours with the medals, so unusual. I love your canes! Your bought some great ones. What an interesting cane. Its amazing to me all the variations and designs for canes. I like the little umbrella stand you have also. Im trying to recall where I saw a really good one here recently but was vetoed from buying (since we are packing). I think it was PotteryBarn. We have a few really neat hand carved canes that we have purchased when on vacation in Jamaica. Ill have to get those out and post a few pictures for you. I have an ugly umbrella stand with no umbrellas in it, but it is full of canes and currently yardsticks waiting for a project. But there is nothing in there as cool as that walking stick! What a cool idea! I would have never thought of collecting something like this! I love the history behind it! I came across an antique shop that specialized in German antiques...they had an incredible collection of these walking sticks..at great prices. It's no wonder you went back and bought that umbrella stand...it is terrific! I love your umbrella stand. What a wonderful collection of canes you have already. Unfortunately my cane collection only includes the ones I use when I need them. Kim, I love your collection! That German walking stick is amazing! My husband and I have travelled through Germany and Austria. It is SO beautiful! I have a small collection of canes by my front door also. I think I have 5 so far. What a wonderful story. I've never seen anything like this on hiking sticks. Lovely post and very informative. You lucky dog getting to go to Scott's!!! What a great posting... I bought two walking canes this past Spring at a yard sale, to put in our umbrella stand in our entry. I did not kow what the tags on the walking canes were. Thank you for the information. I will now have to research where my canes have been! Love your blog, your home is beautiful! so this is how it is done? and yes...MUCH easier when all kids are grown and gone!